Today the Zone 6 cordon moved back one street and Zone 4 was opened so I decided to take a look. It was smelly, shocking and somewhat demoralizing. Smelly, I went to the corner of Colombo & Peterborough Sts. and from there the smell from the rotten food in the nearby shops and restaurants was loud and clear. The other noticeable thing was the dirtiness of the whole area. When we were cordoned and curfewed for 18 days after 222, there were repeated sweeps of the streets by street cleaners and so by the time the cordon was reduced, the opened up area was pretty much as clean as it has always been! But today was totally different, it’s a mess, a total mess. Yes, the town has been opened up but there is so much crap lying around everywhere, no-one would really want to go there. Sure its early days but a lot of work needs to be done here. 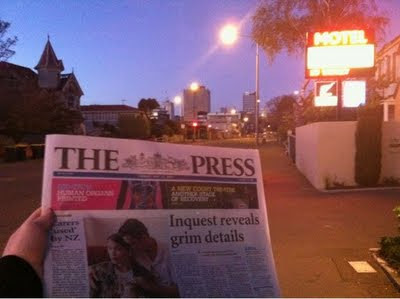 I went down Peterborough St. from Colombo St. to Madras St. and was shocked. It was truly amazingly sad what has happened, the land and building damage was mind boggling, the whole street and every building has been affected - nothing is straight anymore. Shocking and demoralizing, I went to see what was left and was expecting to see Strawberry Fare in a state that would be ready to reopen soon. From what I had seen soon after the quake, from my exclusive view inside the cordon, the building looked ok. But that was from the east. Today I saw the building from the west and it became clear that one of our favourite restaurants would not be opening for some time. 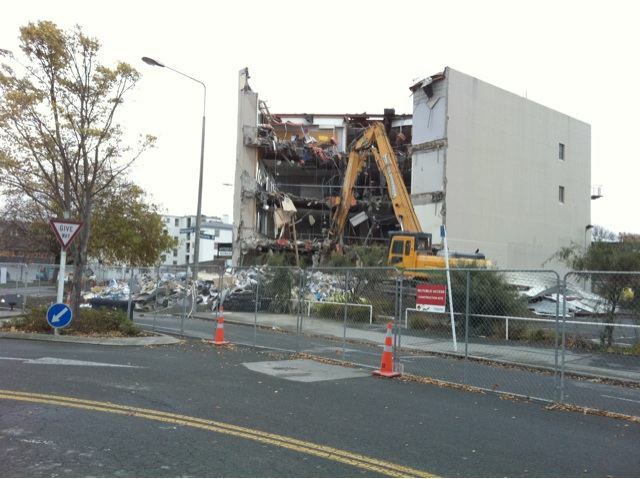 The east-west shaking of the quake had peeled away large sections of the western side of the building leaving it looking sadly disfigured. Shocking and demoralizing, as the signs say, EXTREME DANGER KEEP OUT and ROAD CLOSED! Lots of red, white & black but no sign of the army boys here! 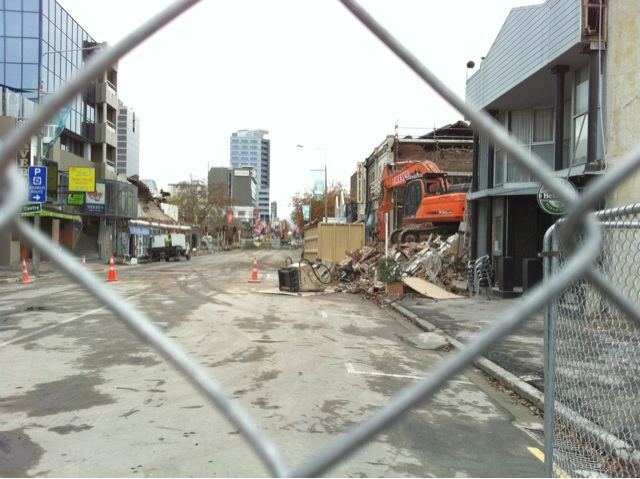 Looking at the block along Colombo St. between Peterborough and Kilmore Sts. It does not look good. Starting at the corner of Peterborough and Colombo St. where the Thai Pho restaurant was and working around the street, this is how it goes. Thai Pho – demolished. Lyme Bar – damaged but standing. Café Valentino – demolished, Art gallery, Scottish Shop, Chinese restaurant – to be demolished for sure, 2nd hand store, Sushi Shop & Whiskey Galore – building looking ok! Johnson’s Grocer, Metro Café – demolished, Sala Thai/2 antique shops/thai massage/hair dresser/dairy/Baiyok Thai Restaurant – all surely beyond repair. Thai Smile – will be open as soon as possible. Boutique dress shop – demolished. Building with hair designer on street level – badly damaged. By golly the street is going to change no matter what happens because it has to, there’s hardly anything left! 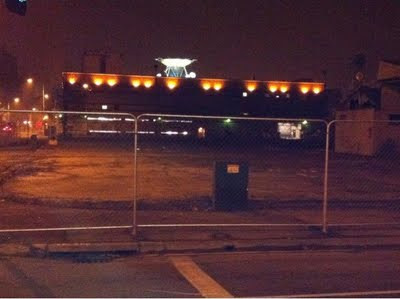 The Casino is hoping to open by the end of May - great to see the lights on! 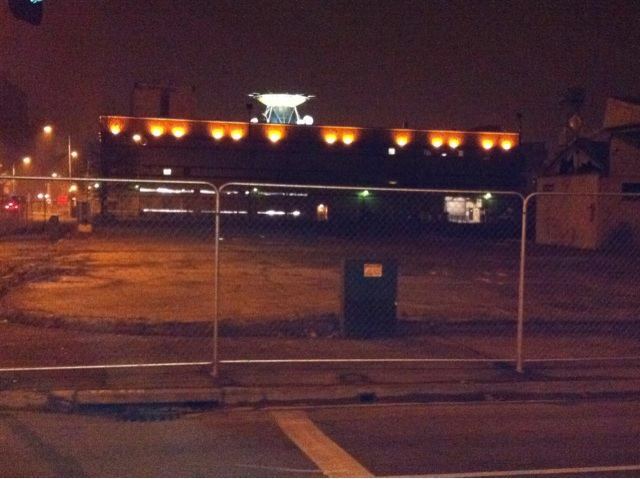 I then went up the Casino area and was once again surprised to see the damage. Whole swaths of the street front are either gone or partially demolished. On the good side, the lights were on at the casino and they have gaudy but impressive signage up advertising the reopening. The lights at the Casino stayed on into the evening……nice touch guys nice! 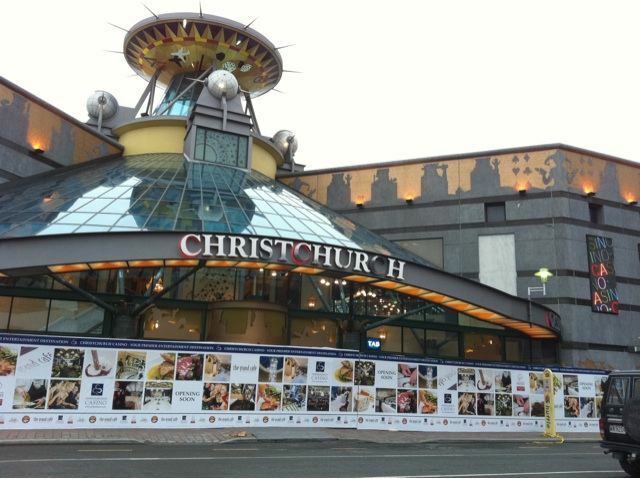 The Casino once again lights up the Christchurch skyline - looks nice cos its our skyline! I must also mention Himalayas, our favourite Indian restaurant. The ½ rebuilt building was wrecked again on 222 but amongst the rubble I could still find the “Opening Soon” sign. We do look forward to them opening soon! Himalayas, destroyed after the September quake, was being rebuilt only to be beaten to the finish line by the 222 quake. Hope amongst the carnage. Today was a reality check as it was apparent that there is just so much more work to do even in this part of the city. We look forward to more hope and less carnage as the days move on. 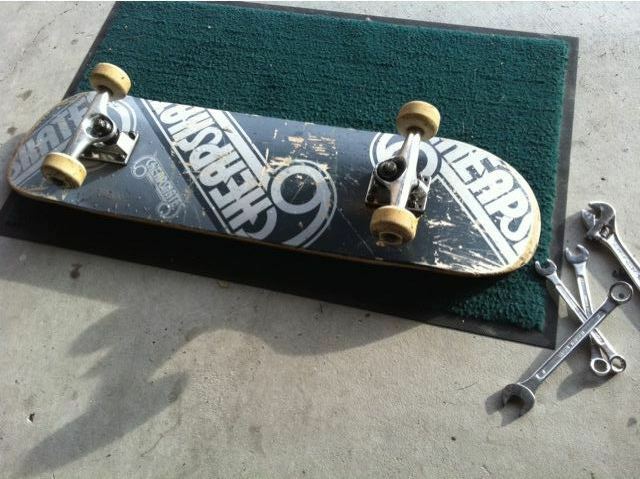 Luckily when Mr12 and his skateboard parted company this morning, it was his skateboard that ended up down the drain…..
“Tamati said that we should make the most of the good weather while it lasts” was the reason mr12 decided to skateboard to school today. But he was soon back home saying his skateboard had gone into a drain and was sitting in water more than a metre down. Now anyone with a mr/miss12 in the house knows that stories are not always as they actually may be so it was with a dose of salt I took this news. I asked for a repeat and he said he’d been skating along, got caught on some rubble and went flying, him to the ground and the skateboard into an open drain! 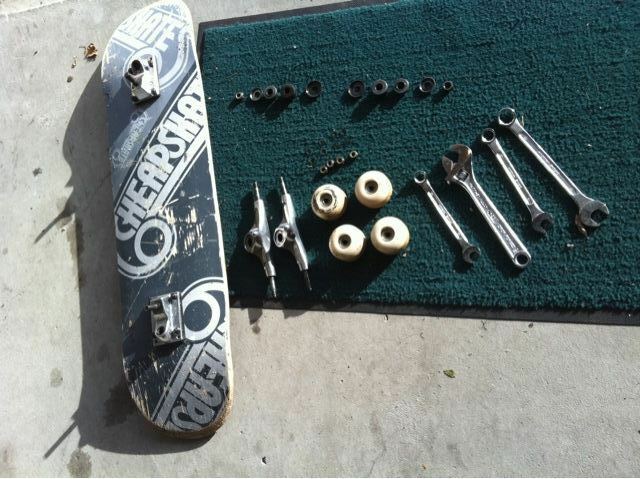 Gulp, I thought at least it was the skateboard that went into the drain! But it still seemed just too surreal! An open drain? After securing the motel I headed off the 80 odd metres to where the “drain” was. Sure enough there was a drain without a cover. Peering in I could see the skateboard sitting serenely in the drain water, probably about 1½ metres below the road level. Mr12 wanted skateboard back so I told him to dive in head first while I hold his school shirt. Funnily enough he was hesitant but we had to get on with it! School was starting soon! It was looking to be a bit tricky but then a passerby stopped and offered to help saying, “I’ve done it before.” Made me wonder just how many drains in Christchurch don’t have covers at the moment! So we both grabbed a leg, upended mr12 and lowered him in! Simple! He reached down and plucked the skateboard out of the drain water. 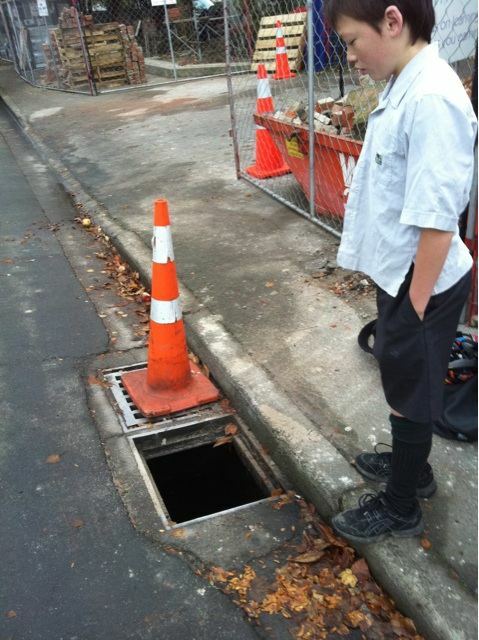 We then pulled the legs with body and skateboard attached out of the drain and sent mr12 off to school….on his bicycle. Hopefully there aren’t any open drains big enough to swallow that! Epilogue: Dad got to pull the skateboard to bits to hopefully stop it from rusting too much but I think this might be an insurance job! 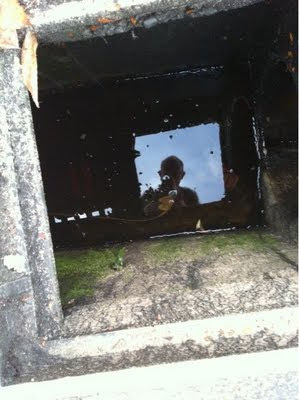 Epilogue 2: Dad got to ring the City Council and report the missing drain cover. 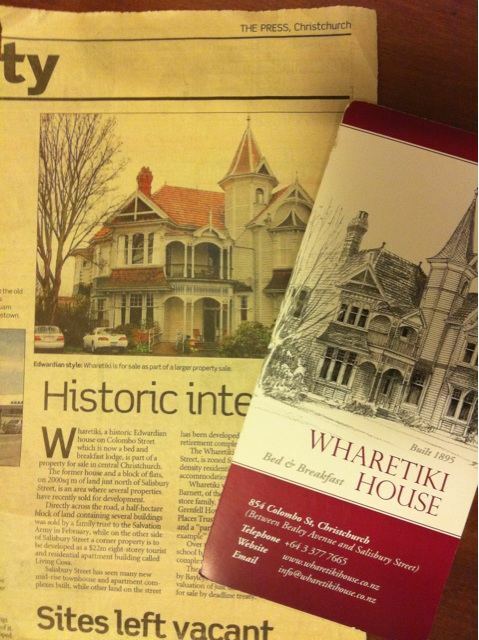 Moral of the story: In post quake Christchurch, don’t expect anything to be normal -welcome to the new normal! Locals have a pretty good idea about what is happening in Christchurch, but we have found that those from outside of the city don’t really have a clue. Understandable. One of more common misconceptions is that the central city area is accessible. Many guests arrive asking for help getting reservations at restaurants that just aren’t there any more! The truth is that the Red Zone is guarded by the NZ Army and no-one gets in without permission. Many ask why this is, and the reason is that it is just not safe. Aftershocks are still continuing to jolt us and it was one of these that resulted in people being crushed in buses and outside the buildings they were shopping in. This cannot be allowed to happen again and the central city area must be made safe before it is reopened. So this is a quick round up of what is happening – according to Jeff. Its not complete but will give you an idea of where the city is at. On Sat. 30 April, the National Civil Defence Emergency ended and responsibility for managing the cleanup is now in the hands of CERA (Canterbury Earthquake Recovery Authority), a government department set up with special powers which in some ways exceed those of Civil Defence. The Red Zone, with limited entry, is inside Salisbury St., Madras St. St. Asaph St., and Cambridge Terrace. Hopefully the northern perimeter will be reduced to Kilmore St soon but this will not happen until some more unstable buildings are demolished. If a building becomes unstable, roads can still be suddenly closed until the danger has passed, which usually means bringing the building down. Due to the widespread damage, it is estimated that the Red Zone may remain off limits until at least the end of the year. At the latest count almost 350 buildings require either demolition, partial demolition, or work to make them safe and the list is still being added to. You may think that it is the old, heritage style buildings that headline the list and while that is true, the brute force of the quake and associated liquefaction has also done terrible damage to many modern buildings as well. Several high rise buildings are considered so unsafe that No Go Fall Zones have been set up around them. The Hotel Grand Chancellor is one such building. This all adds up to an unsafe central city area that cannot be opened up. 50,000 people used to work in the CBD area and to start returning to normal, a central city retail area on Cashel St. between Colombo St & Oxford Terrace is planned to be reopened at the end of October and will include the Ballantynes Department Store. Other than that, the only places open in the central area are; Botanical Gardens, Punting on the Avon, Cook’n with Gas restaurant, Canterbury Cheesemongers and 2 restaurants in The George Hotel. The Art Gallery is the Civil Defence HQ and won’t reopen for some time. 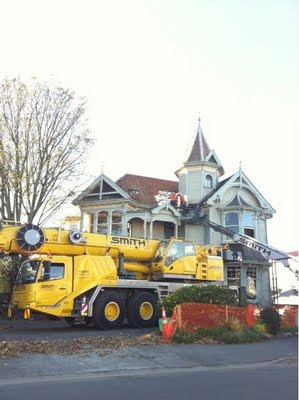 The Arts Centre is severely damaged and is not expected to reopen for around 4 years. The weekend markets have relocated to Ferrymead Historic Park. QE2, the site of the 1974 Commonwealth Games and a proud addition to our city that recently held the 2011 Paralympic Games, is a total write off and may not be able to be rebuilt on the same site. Outside the city centre, most activities (jet boating, ballooning, wildlife parks etc.) are operating normally. 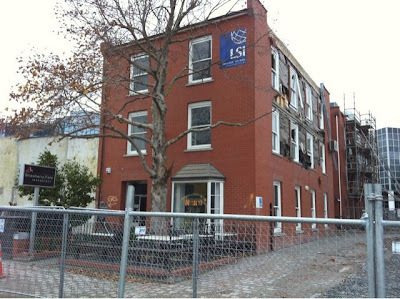 Closer to home, the buildings along Colombo St. between Peterborough and Kilmore Sts. were largely destroyed beyond repair in the quake. The only restaurants left largely undamaged are Strawberry Fare and Thai Smile and we look forward to them opening once the cordon is lifted. Café Valentino, Metro Café, Johnson’s Grocer, are all gone but their owners have already put plans in place for the rebuild. 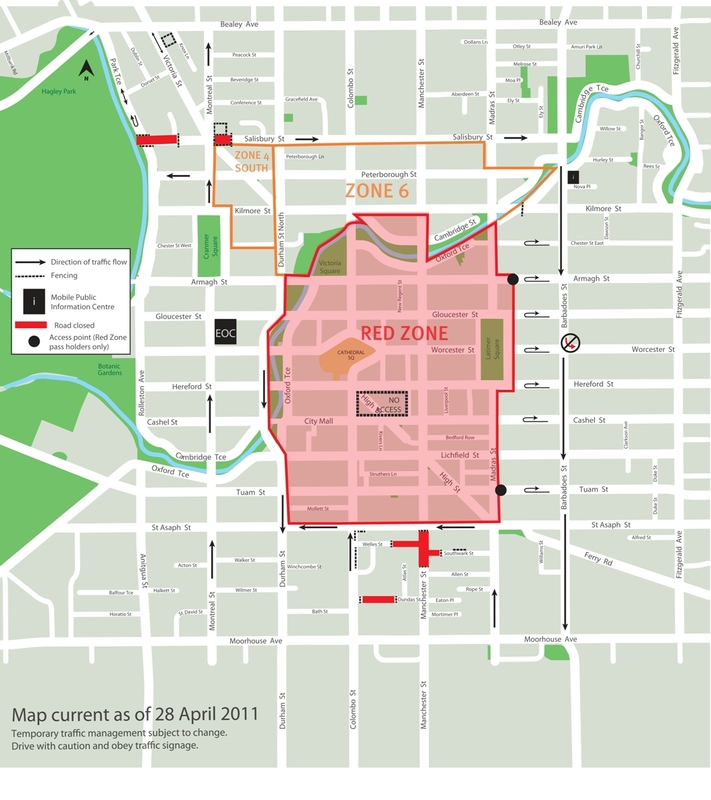 Approximately 1/2 of the restaurants and bars in Christchurch are inside the Red Zone and this has resulted in the suburban bars enjoying a roaring trade. Good for them but it means that they can be extremely crowded. Some advanced planning is neccessary to enjoy your meal! 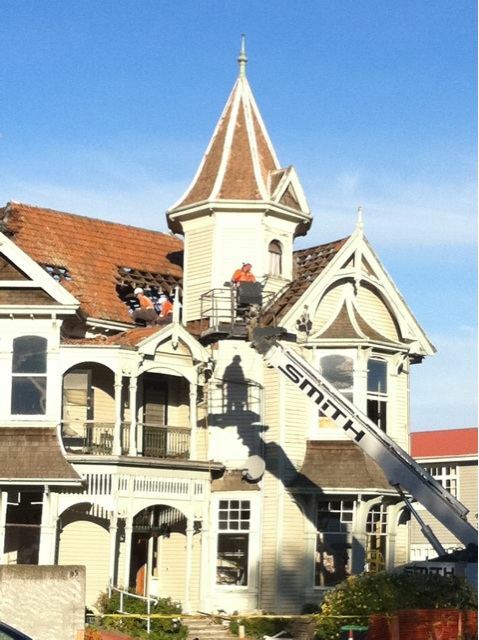 The Town Hall and Convention Centre are both damaged and won’t be reopening until early next year. It is hoped that AMI Stadium will be ready for next year’s season start at the end of January. 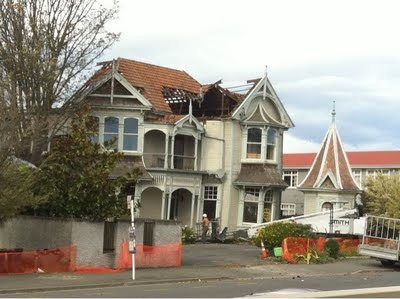 The eastern parts of Christchurch were also badly hit and an estimated 10,000 houses will need to be rebuilt. The construction of hundreds of temporary houses in parks is about to begin. An indication of the damage to the infrastructure can be seen by looking at the 2000 portaloos that now dot streets. The quake has basically stuffed much of the sewerage system on the east side of the city. Along with the portaloos, some 30,000 chemical toilets have been distributed for in home use. People have to empty their full tanks into 400 human waste disposal tanks spread around the city. Because the Poo Ponds, as we call them, are damaged and not operating at 100% capacity, raw sewage is being pumped into the rivers and to reduce the pressure, people who can flush are being asked to not flush too much. Two months after the quake, a lot has been achieved but the sheer magnitude of the damage means that it will be a long time before Christchurch begins to return to normal. Estimates are anything from 5 to 10 years for the rebuild . This means that some people will be able to visit several times in this period and see the rebuilding of Christchurch, the Garden City.